Reconciliation is probably off the table for Slash ... 'cause less than one month after calling off his marriage, the rocker got matching tats with his new GF ... and then MOVED IN with her. 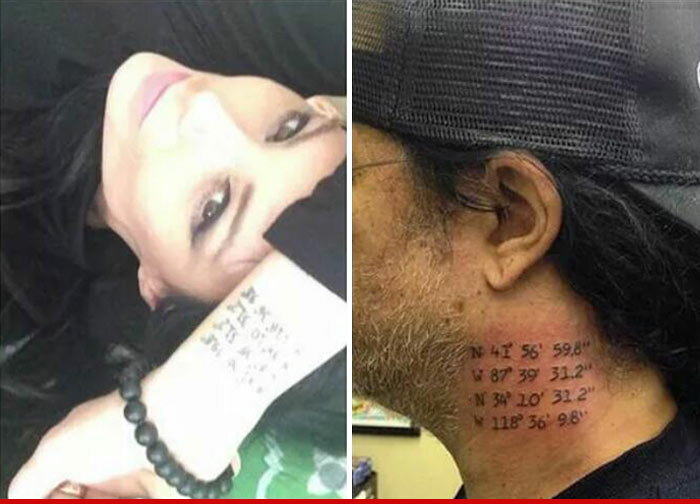 TMZ has learned ... the 49-year-old decided to prove his commitment to Meegan Hodges by permanently marking their bodies with a matching set of GPS coordinates. And if the tats weren't proof enough of a serious relationship -- we've also learned they've moved into a house together in the deep part of the San Fernando Valley ... with Meegan's two teenage daughters. As for the home, it's nice ... 3,120 square feet, 5 bedrooms, 5 baths, a pool and a rooftop deck -- and we're told Slash is leasing it. As we previously reported, Slash filed for divorce from Perla Ferrar on December 30th after 13 years of marriage. They have two kids of their own. So far, no comment from Perla ... but we're guessing she probably won't be sending a housewarming gift. I'm Coming After Your Jewelry!! !